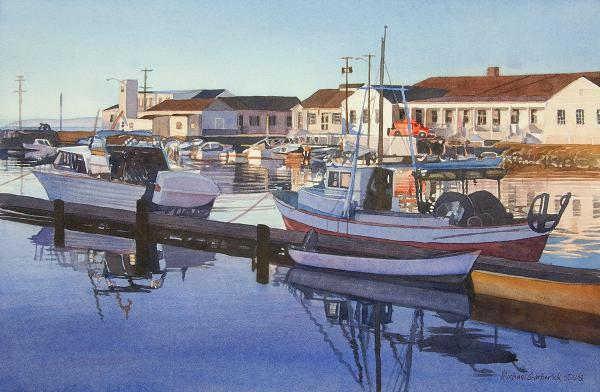 The San Diego Watercolor Society February 2019 People’s Choice Award went to artist, Mike Garberick for his painting “Port Townsend Boat Haven”. This painting was also awarded Best of Theme! We asked Mike for his insight about this outstanding painting and how he got started. Read on to learn more about his painting journey. It’s from a photo taken when my family visited Port Townsend in 1962 to see the World’s Fair. I loved the time of day. The sun is just up and the foreground is still in shadow. The other side of the docking area is in bright yellow light. With the sky reflecting in the water along with all the boats and interesting buildings I found it would be a challenge to create in watercolor. And it was. What else can you tell us about your painting style or how you got started? I got started in 1998 when I took an amateur watercolor class. The instructor after the first few classes said I could be getting awards someday. I did mention that I have been drawing since I was a boy and went to college majoring in Illustration and Design getting my Associates Degree. I’ve been in the graphics business for 35 years. We know you are long-time volunteer and member of the San Diego Watercolor Society. Can you tell us a little bit about your role at SDWS and / or some of your favorite aspects of the organization? I joined I think 2013 and got a email from Carolyn Rosado asking me to come in and meet the then president. She had seen my website that I designed for my work and it was done in FileMaker Pro and Adobe Dreamweaver which was exactly the same way the then SDWS.org was set up. She asked for backup and ideas because they were transitioning to a SQL base system. So I mapped out the website at that time and spent time later making sure the new site did at least as much a the old one. Trying times. Later when that was put to bed I helped run the monthly meeting AV equipment for a couple of years. Now I just help on jury day with the pictures of artwork sent in wrong or not at all. I don’t have a website although I have a free membership at Fine Art America. They however limit the pieces to 25 or so. Mostly people would see most of my current work at sdws.org through a search. This entry was posted on Saturday, March 2nd, 2019 at 1:11 am	and is filed under Member News, Shows / Exhibitions. You can follow any responses to this entry through the RSS 2.0 feed. You can leave a response, or trackback from your own site. CONGRATS, Mike! My “Coffeetime” (awarded) was on the People’s Choice list as well. Nice that SDWS is sharing those results each month!